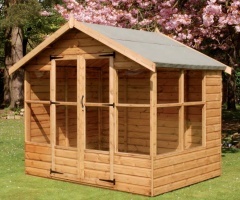 The Popular Summerhouse comes with T&G  door & roof and double mortice and tenon doors. This traditional building looks lovely in any garden large or small. 38 x 50mm floor joists, Press lock and key, Black T hinges and D handle on door. Our entry level summerhouse comes with T&G floor and roof and double mortice and tenon doors. By adding a side window you can maximise all the light available to you from the buildings position in the garden.